I've tried out lots of different subscription boxes, but not many have been as much fun as L.V. Kiki. Every month, their fashion expert hand picks a selection of elegant costume jewelry and accessories. You can have this package shipped to your door every month for only $19. With fashion constantly changing, and trends going in and out in only a few months, it's not always easy to keep up. L.V. Kiki makes it possible to stay at the height of fashion all the time for an affordable price. I got to sample the L.V. Kiki June package, and it was definitely a lot of fun. Who doesn't want to tear into a package filled with jewelry? The box arrived beautifully packaged with purple tissues. Inside, each of the pieces came with it's old beautiful organza bag with a purple tie. There seven trendy, pieces in my package, all a Bohemian style that matches my wardrobe perfectly.The set included both both jewelry and a scarf. Each of thee are definitely high quality pieces that won't turn your skin green. Here is a little about each piece. This lovely scarf is big enough to use as a light weight shaw on a cool summer night. It has a intricate pattern in a beautiful earthy colors. There is also a black fridge running along the length of the scarf. It's great for summer, but will carry over nicely into the fall. This is a delicate necklace on a silver-tone chain. The pendant is made from a polished stone. It's a simple piece that will look great with any casual attire. This is one of my favorites from this box. The bangle bracelet is bronze in color. It wraps nicely around your wrist or could go higher is you have slim arms. One side is a leaf and the other is a pretty blue stone. My teen daughter snagged these! This is a great set of three headbands. One is lacey flowers, one is plain black, and one is gold beads. With these you are set no matter what you decide to wear for your morning run or yoga routine. This one is a gold-tone necklace with a stunning arrow-head pendant. Simple yet elegant! This gold-tone necklace has an evil-eye pendant. If you feel you need a little protection, this piece can be both trendy and powerful. Last, but but not least, we have another golden chain, this time with a golden leaf pendant. It matches nicely with the lead bracelet! Overall, the jewelry is definitely a good value for the money. Even though it's costume jewelry, it's a very high quality and well made. 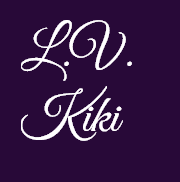 To learn more about LV Kiki or to start your own subscription, you can visit their website or follow them on social media. One lucky winner is going to receive a one month subscription to L.V. Kiki. To enter, just fill in the Giveaway Tools form below. This giveaway will 7/27/16 and is open to the US only. The winner will be notified via email and will have 48 hours to reply. Thanks again to the sponsor for offering this fantastic prize. I learned they have a rewards program. keeping you on trend through every season. The website shows you what is trending now and offers a clearance section. 1. They have a nice rewards program for shoppers. 2. They have a super clearance section which I always look for whenever shopping online. Since they began, the L.V.Kiki team of strong women have been devoted to empowering other females to pursue their dreams and have been donating to women empowerment organizations across the country. It's awesome shipping is free (in the US) on all subscriptions. I like the Braided Flower Head Wrap. I learned that it's $180 if you prepay for the whole year. I learned that sends their subscribers 4-6 seasonal accessories per month for $19/month.